Thank you for the article my friend !!! Thank your for the article.Keep it writing interesting articles.Good luck. 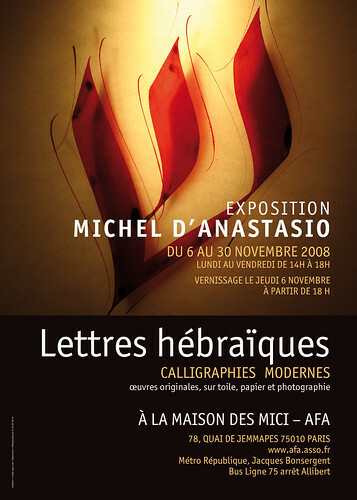 I don't know about Michel D'anastasio's work. Too bad more people don't know about what I've done. Thank you for the article. All the best. i'm a photographer by hobby and came across your blog recently. interesting it is. informative too. keep writing. Cool stuff here. Nice one indeed. Great articles and love the name - you haven't updated in a loong time - please do ! wish I was in France so that I could check out your friend's show. I also like your articles too. It ain't a shameless plug if its spreading the arts.